Synonyms: Asclepias physocarpa (E. Mey.) Schltr. Robust perennial herb, up to 2.5 m tall. Stems usually single, branching near the top, upper parts with spreading white hairs. Leaves opposite, sometimes sub-opposite or crowded near the ends of branches, narrowly oblong to lanceolate, 4-12 cm long, mostly hairless except for soft white hairs on the midrib and margins. Flowers in extra-axillary, 5-12-flowered, nodding umbels. Corolla strongly reflexed, white. Corona lobes attached 1.5 - 2 mm above the base of the staminal column, white, tinged pink, mauve or purple, laterally compressed, as tall as the column. Follicle more or less erect on a twisted pedicel, spherical to subspherical, often somewhat depressed on one side, distinctly inflated, not beaked, covered in soft bristles. See Gomphocarpus fruticosus for comparison. Habitat: A sometimes weedy species in grassland, mostly in disturbed areas. Worldwide distribution: Native to South Africa, Swaziland and southern Mozambique; most likely introduced elsewhere in Africa. Bandeira, S., Bolnick, D. & Barbosa, F. (2007). Wild Flowers of Southern Mozambique Universidade Eduardo Mondlane, Maputo, Mozambique Page 117. As Asclepias physocarpa (Includes a picture). Goyder, D.J. & Nicholas, A. (2001). A revision of Gomphocarpus R. Br. Kew Bulletin 56 Pages 788 - 790. Setshogo, M.P. (2005). Preliminary checklist of the plants of Botswana. Sabonet Report no. 37. Sabonet, Pretoria and Gaborone Page 27. Hyde, M.A., Wursten, B.T., Ballings, P. & Coates Palgrave, M. (2019). 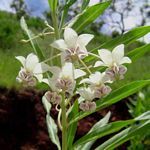 Flora of Zimbabwe: Species information: Gomphocarpus physocarpus.